This page will contain meeting minutes, agendas, and any other documents needed for stakeholder committee business. Documents of public interest, such as a Word version of the watershed management plan, will be placed on the Information Clearinghouse page. New language in the City Stormwater Manual- Tom Wellman, City of Columbia Stormwater Engineer, asked that the new "channel protection" language that Columbia has recently incorporated into their manual be posted. Click here to see the new language. February 9 - Meeting Canceled. March 2 - Meeting Canceled. March 23 - Meeting Canceled. Information presented at the meeting held on December 11, 2008 can be accessed here. "NOTES" boxes within the presentation summarize the points mentioned in the presentation. The Department of Natural Resources (DNR) monitored the water quality of the impaired section of the Hinkson (downstream of I-70) over the last several years. Stormwater outfalls, as well as the Hinkson itself, were tested for a variety of contaminants such as metals, organic compounds, salt, turbidity, and others. Each year, the Hinkson failed to have the diversity of aquatic life needed to be consider a fully functioning stream, though no single contaminant was ever found to be at fault. For a copy of the DNR Phase I study, click here. For a copy of the DNR Phase II study, click here. For a copy of the DNR Phase III study, click here. The Hinkson Creek Watershed Restoration Project Phase I grant developed a draft watershed management plan, which served as the base document for the Phase II stakeholder committee to work with. 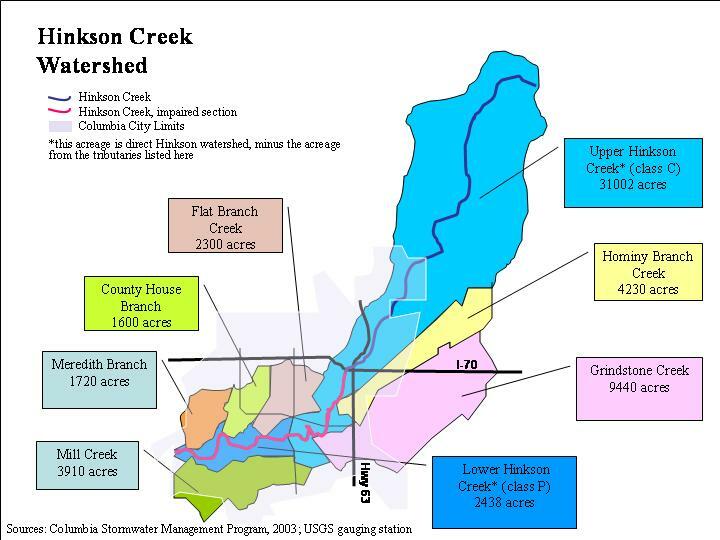 The watershed plan identifies the urbanized hydrology as the main contributor to the degraded condition of Hinkson Creek, identifies a "hotspot" area in which to focus restoration efforts, and makes recommendations for the restoration effort. Boone County passed a stream buffer ordinance in May of 2009. The ordinance went into effect on June 1, 2009. The ordinance is not retroactive, only new developments and redevelopments are affected. The stream buffer ordinance is very similar to the City of Columbia's stream buffer ordinance. For a link to Boone County's stream buffer ordinance, click here. Boone County passed a stomwater ordinance February 2, 2010. The ordinance went into effect on April 15, 2010. All design plans approved by planning and zoning before April 15, 2010 will not be subject to this ordinance. Plans in the design phase, or not approved by that date will require stormwater controls. The Commission has chosen to delay the implementation of the abeyance (Section 9.3) until the Columbia City Council enacts similar legislation. For a link to Boone County's stormwater ordinance, click here. A stormwater ordinance and a stream buffer ordinance were both passed by the City of Columbia in 2007. Neither ordinance is retroactive, only new developments and redevelopments are affected. The stream buffer ordinance requires a setback of varying width, dependent upon the size of the stream. The stormwater ordinance requires a level of service approach be taken on applicable developments. Run-off from areas converted to impervious surface are ameliorated by various BMPs that must be installed to detain and treat the stormwater. For a link to the City stormwater ordinances, click here. The Hinkson drains roughly 88.5 square miles of land, all in Boone County. Hinkson Creek itself is 26 miles long, originating east of Hallsville and traveling southwest to join Perche Creek in southwest Columbia. Several large tributaries spill into the Hinkson within the Columbia area. Grindstone Creek and Hominy Branch originate from the east, Flat Branch and County House Branch drain the interior of Columbia, and Meredith Branch and Mill Creek drain the western portion of Columbia. For a map of the sub watersheds of the Hinkson, click here. 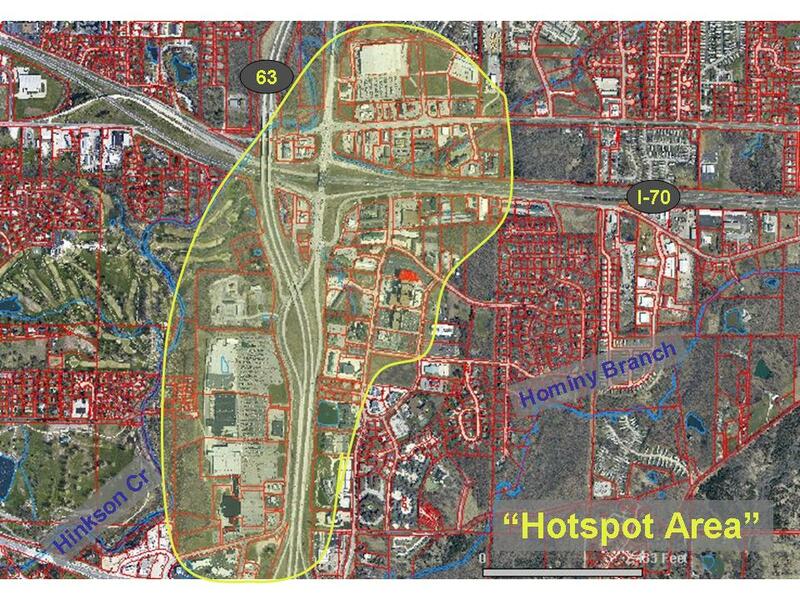 For a map of the hotspot area of interest for our cost-share program, click here. The USGS monitors the flow of the Hinkson just below the Providence Road bridge. The gage was put in place in the late 1960s, but was decommissioned for a decade and was brought online again in 2007. To see the flow of the Hinkson and an archive of the Hinkson's flow, click here. The weather station at MU's Sanborn Field (at Rollins and College Ave) has been recording weather data for many years. This data, or at least the last decade of data, is searchable via the MU website. Precipitation data, both daily and annual accumulation, soil temperature, air temperature, and other parameters, are available. Click here to go to this website. A graduate student at the University of Missouri conducted a study of attitudes of residents in the watershed about Hinkson Creek and other environmental issues, click here to see the study. Collaborative adaptive management is a science-driven, stakeholder-based process for decision-making while dealing with the scientific unknowns inherent in many physical and biological systems. It uses a continuing process to make changes and then to determine the effect of those changes. View the Department of Natural Resources' fact sheet here.